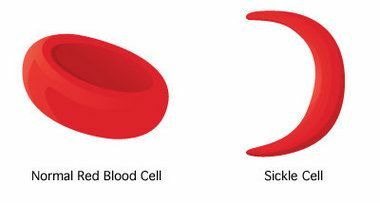 Sickle Cell Disease (SCD) is an inherited blood disorder that causes the red blood cells to become sickle shaped, preventing the cells from circulating to parts of the body. These cell’s short life-span cause a shortage of red blood cells and result in anemia (low hemoglobin level). Sickle Cell Disease occurs in approximately 1 in 500 African-American births, and the trait occurs in approximately 1 in 12 African-Americans. Those with the Sickle Cell Trait can be blood donors, but those who have the disease cannot.